Southport Pier is located in Southport; Lancashire UK and on the 17th March 1859 after many years contemplating building a seaside attraction in Southport the local planning committee finally put the building plans into process. The winning bid for the contract to build the pier was for £8700 and the magnificent architecture was designed by Sir James Brunlees. 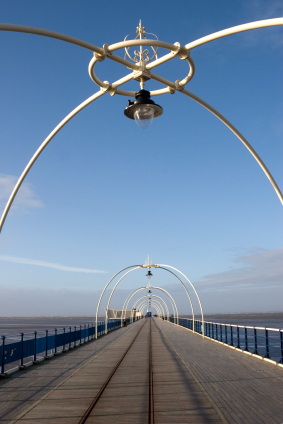 Initially Southport pier took a year to be built and was constructed upon iron supports. Once the pier was completed the local people of Southport held an opening celebration that was to go down into the history books and with a magnificent fireworks display Southport pier was officially opened up to the public in 1860. The pier was an instant hit but being so long and exposed the passangers who used the pier to access the steam boats where left facing mother nature full on. It was finally decided that in the summer of 1862 the boating company would build a shelter on the end of the landing stage along with a place where holiday makers could stop by and get refreshments. As you can imagine walking with all your luggage to the end of the long pier after arriving as a tourist to your holiday destination wasn’t ideal. The company therefore decided to erect a tram line, initially for luggage only but later to carry luggage and passengers. The tram line was first opened and put into use in the year of 1862 and over the next few years the tram was upgraded to a steam powered tram. There was a setback as unfortunately on the 1st August 1865 a traveller was killed using the tram service. Mrs Frances Bateman was thrown from a tram car along with her brother in law. Mrs Bateman was killed after hitting the railings and her family sued the tram company for a sum of 650 UK pounds! This might seem like a small amount of compensation, however back then it was seen as a lot of money. Piers, being so exposed, are often prone to disasters from fire, storms or boating accidents. Southport Pier wasn’t exempt from such disasters and in 1889 the refreshment rooms that had provided much needed rest and relaxation at the pier head collapsed folling a storm which swept away the foundations. 8 years later on the 18th September 1897 a fire burnt down the pavilion however the pavilion was replaced by a more splended incarnation in 1902. In 1905 the tram line underwent an upgrade with the original steam powered trams being replaced for more modern and safer electric ones. By the late 1920’s the once popular steam boats had all but ceased to service the pier head. This was because silt had built up in the water and this therefore only allowed much smaller boats to be able to dock at the pier head. Southport Pier was not seperated from the main land during the war; as many of the other piers in the UK had. Instead the pier was shut to the general public and big vast search lights where put in to spot inbound enemy aircraft who were tagetting the many big trade and manufacturing towns in the north of England. Following the conculsion of the war the pier was again open to the public however due to the fact that there was no longer an electricity supply to Southport the tram line was not able to be used. The decision was therefore taken to move to a diesel powered tram so following further investment in 1950 the new diesel service was opened for the passengers to use again. Fires in 1933 and 1959 truncated the piers overall length to 3650 feet and destroyed the pier head building. The current piers length makes it the second largest pier in the UK, after Southend pier. The pier was originally 3600 feet in length but had been exetend in 1868 to 4380 feet before the fire brought it’s length down to the 3650 feet that we see today. 1968 saw a redevelopment of the shore side buidning but instead of a sympathetic renovation the original pavilion was demolished to allow for amusements, a restaurant and a bar to service the new demands of the holiday makers. Through the 70’s and 80’s the pier continued to serve the locals and holiday makers with a coastal retreat to enjoy the sea air and have ice cream or fish and chips. By 1990 with declining visitor numbers and increased repair costs Sefton Council took what could have been a killer blow to the pier and applied for the pier to be demolished. The council application was defeated by one solitary vote and the now grade II structure was saved. “Southport 2000 – Save The Pier Group” was formed and this later became the “Southport Pier Trust”. Over the following 9 years the group raised money sufficient money from the Heritage Lottery Fund as well as the European Merseyside Objective to allow for the entire pier complex to be restored. Since the restoration and refurbishment of Southport Pier, holiday entertainment and seaside strolls have once again made it back to the history books. The wonderful pier is once again basking in glory. Southport pier boasts a mile long tramline that’s the perfect entertainment to keep the kids occupied during your summer holiday. It’s a lovely place to visit to let off steam; a trip to an English seaside holiday attraction wouldn’t be complete without purchasing a stick of traditional rock! At Southport pier you can certainly be sure to find all the traits of a traditional English holiday. Fish and chips right down to ice cream and candy floss, you will be able to savour the delights that are provided by the numerous catering companies that are running shops on the pier. At the end of the tramline there is a pavilion that houses many attractions to keep you busy on your holiday. An Arcade that works on old pennies which are available to buy from several change machines located in the arcade. An interactive theatre display, displaying pictures of local wildlife and coastlines. There is a cafe where you can take a much needed rest from you seaside travels, and sit down to a famous cup of English tea. In 2002 the pier was awared the “Pier of the Year” from the National Piers Society. The pier is open ever day of the year except Christmas day, and for safety reasons it remains closed during the Southport air show. There is no cost to visit the pier making it well worth your while to visit the attraction. John Gerald Armstrong fell off the pier on 28th September 1906,and died from his injuries on 2nd October of that year..
His Death certificate states death was by falling from the pier whilst at play. What is known about this incident? Are there any reports on the circumstances that led thereto.? Many thanks for taking an interest in Southport Pier, The first lesiure pier in GB ~ Monday August 2nd 2010 is the 150th Birthday of our heritage asset. Modest celebrations run from 11am through till 4pm ~ Pop along and be a take part in living history on the original ‘White Knuckle’ walk ! It was much longer than I thought. 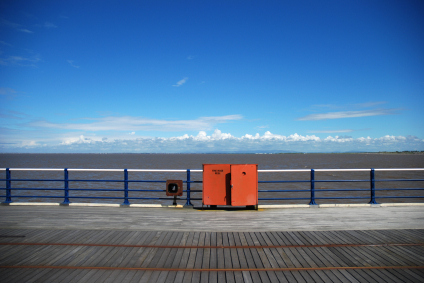 How long is the Pier from the Carousel to the Pier Head? How long is Southport Pier from the gate to the sea end?